Hannah, thanks for hanging out with us this summer. Have fun freezing at Cornell this winter! With a continuously running clock do one 10 meter sprint the first minute, two 10 meter sprints the second minute, three 10 meter sprints the third minute… continuing as long as you are able. Some of the posters are a little corny but I’m going to save the group so I can look at them once in a while. The first one about today being more important than tomorrow is the best one. Thanks for the sprints Eli! This was a fun Lung burner. Will miss all. You all better get stronger fitter, and faster while I’m gone. 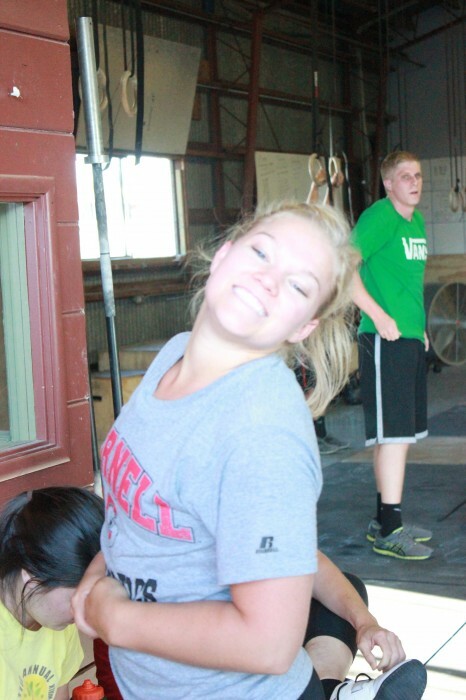 Hanna loved working out with you even though you go to a know name college. Look forward to working out with you again during your winter break. Hannah and JT we will miss you girls, look forward to seeing you in winter! Hannah good luck at school and gymnastics. JT good luck with your new season. That was a fun one today, and to top it off I finally did a MU again. Oh yeah and good job playing fireman today coach!